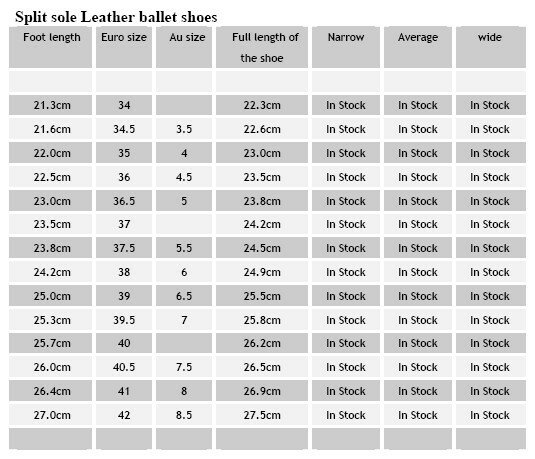 Split sole Leather Ballet shoe is made of premium grade leather. our Inter media split sole Ballet shoe is with traditional outsole,and suede insole shape just model your foot left and right. Full cotton lining and absorbent insole reduce moisture. It is simple and comfortable Ballet shoes for dance lover. 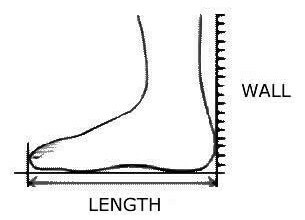 Fitting: size chart is well fit size, for great fit the the shoes full length 5 mm longer than the actual foot length, for snug fit the full length the same as the full length of the shoes, if is a growing foot, specialy age around 10-14 yrs, is recommend to have the full length of shoes 10-13 mm longer than the actual foot length for comfort. Stand up with the heel attach to the wall and measure the distance between the wall and the very last end of the biggest toe, to have you foot length.